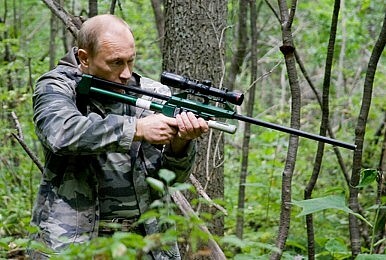 Putin uses a tranquilizer gun to sedate an Amur Tiger in the Ussuri Nature Reserve in Primorsky Krai, 2008. Can the Kremlin sustain its ambitious military modernization program in the long run? Despite a crippling recession, Russian President Vladimir Putin vowed to press on with his 22 trillion ruble (more than $400 billion) military modernization plan, according to Sputnik News. Addressing a group of recent graduates of Russian military staff colleges in the Kremlin yesterday, Putin emphasized that structural reform within the Russian Armed Forces and new weapon acquisitions programs will continue unhindered over the next few years. “A strong army equipped with sophisticated weapons guarantees Russia’s sovereignty and territorial integrity. It also guarantees that millions of our fellow citizens can live in peace. I am sure you understand it quite well,” Putin said, explaining Moscow’s rationale for the massive rearmament program. Touting the strengthening of Russia’s strategic nuclear forces and space defense units, Putin also praised the increasing combat capabilities of almost all branches of the armed forces. He mentioned the ongoing delivery of state-of-the-art aircraft, submarines and surface ships to the Russian military, which is also being equipped with high-precision weapons, combat robots and unmanned aerial vehicles that were showcased at the recent International Military-Technical Forum Army-2015. The big question remains whether Russia can afford the continuous military buildup. In May of this year, Prime Minister Dmitry Medvedev announced that the 2015 3.3 trillion ruble ($60 billion) military budget will need to be adjusted and cut by five percent, or 157 billion rubles ($2.8 billion). The Russian government also ordered 10 percent across-the-board cuts in government-funded services for regions and municipalities, with pension and purportedly defense as the only two exceptions. Consequently,whether the defense budget will genuinely be slashed by five percent remains an open question. In 2015, Russia’s GDP is projected to decrease by 4.6 percent, largely due to lower oil prices and Western sanctions. Moscow is slowly depleting its hard currency reserve — approximately $150 billion — to stabilize the free falling ruble (currently trading at 50 rubles to the dollar, up from 80 rubles to the dollar in December 2014).